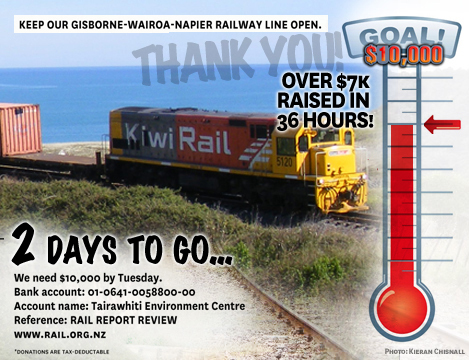 Plans by a Gisborne lobby group to seek an expert independent economic analysis of the KiwiRail report used to justify the Gisborne-Napier railway line have had a boost with nearly $8,000 being raised over the weekend. Gisborne Rail Action Group member and District Councillor Manu Caddie said the response has been overwhelming. The group hopes to raise at least $10,000 to pay for independent economic analysis of the business case for the line. The group has released its initial assessment of the KiwiRail report and says that even if conservative freight figures are used the future for the line looks secure. “Of course there are also wider economic impacts that KiwiRail should consider as a State Owned Enterprise such as the loss of tourism and the potentially much higher costs of freight should the rail not be available and it would have been good to see some of those included as well” said Mr Caddie. ← Over $5,000 already donated in 24hrs!